We love making our homes festive for the holidays. Especially those that make myself and my special someone the focus of the evening - Valentines Day! 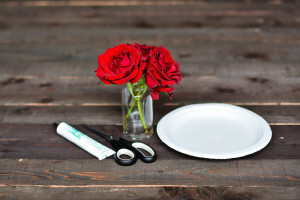 This fun and easy tutorial can be used all year around for any special occasion. 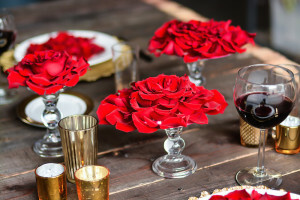 We used the iconic red rose to bring the V into Valentines Day. Grab your supplies and let's get started! Step One: Start by cutting out the plate to a size that equals about 2" smaller than your anticipated finished project. Step Two: Spray paint the paper plate. This will keep if from showing up after you glue all the flower petals to it. Step Three: Petal all of your roses, except one as you will need a full rose for the last step. Start gluing the rose petals around the outer edge. 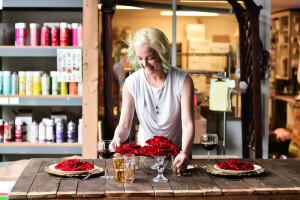 Use the largest petals from all your roses first. Repeat this circular motion - overlap each ring so you do not see the petals beneath it glued to the plate. 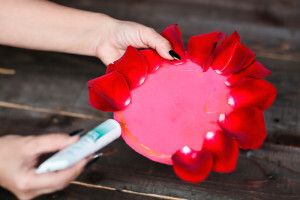 Continue gluing using smaller petals with each ring as you move into the center of the project. Step Four: Take the last rose, make sure it is nice and opened. 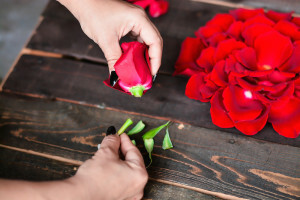 If it's not, gently fold the petals to open the rose. Trim the stem leaving only enough stem to keep the rose from falling apart. Make a clean, flat cut. 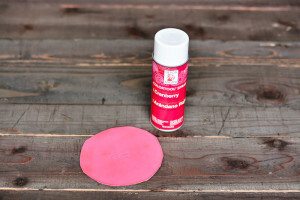 Place a large amount of glue at the center of your project. Place your rose at the center, holding it down to keep it upright. Perfect! It's so pretty! So simple yet carries a big impact. Here, we created several roses and placed them atop candle holders to give them some elevation. Some pretty stemware, plates, chargers and some candles and your table is set! These fresh roses are fairly delecate. We tested ours and left out at room temperature and the next day they were wilted. We have a refrigeration system that can keep them fresh - but your fridge isn't recommended (CO2 and temperature are not optimal for fresh flowers). So, we would recommend making these in the morning of your dinner date and store in a dark, cool location out of direct sun until you are ready to showcase them. All of these amazing images are courtesy of our friend, John at GreyCardPhotography. Be sure to check out all his amazing images on his website.